Add value to your promotion with this custom display! This banner display is portable, lightweight, and retractable and sets up quickly whenever you go. 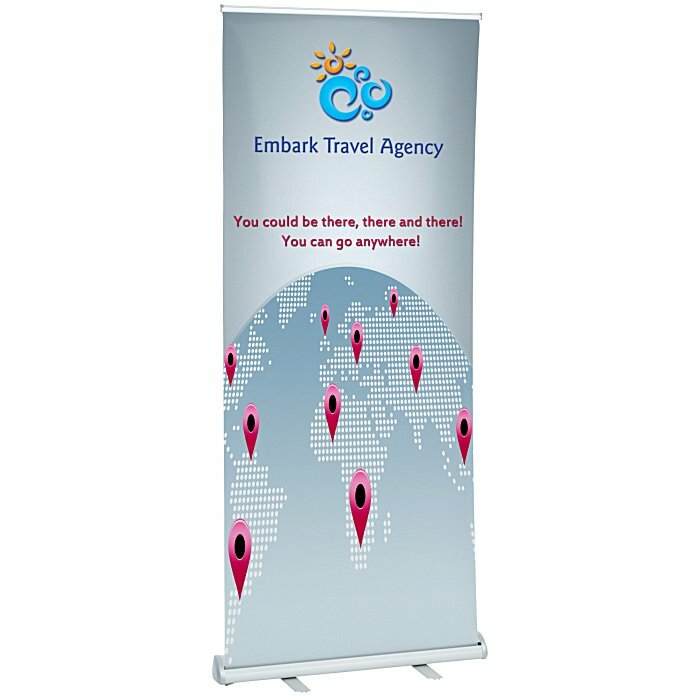 Retractable banner is easy to unroll and rolls up in seconds when you’re finished. Banner is made of durable vinyl that displays colors boldly and resists curling for crisp presentation. Includes a black carrying case for convenient travel and storage. Perfect for meetings, presentations, job fairs and tradeshows! For this Value Retractable banner in a smaller size, please see item #133422-31Value Retractable Banner Display - 31-1/2". Size: 81-7/8" x 35-3/4" x 15"
Your price includes a full-color imprint on the banner front.